A Bodhisattva is a being who has endured the path of suffering, has processed their karma and is in full realization of their darma. That is to say, now they are free to do their life's work which entails "going back" and helping others to attain that same freedom. They have transcended the need for death and rebirth because they have come to know themselves and consequently others so well, that there is nothing left to "die" to. In other words, they have come full circle within themselves. The illusion of physical reality has been put in its place and the power of the Higher Self has been fully integrated into the body. For the Bodhisattva, what is occurring on the physical level is very real, but it is not the end of the story. The Bodhisattva knows that everything is energy, the power of the mind and the purpose of suffering. Therefore the Bodhisattva's master purpose is to relieve the "needless" suffering of the world. This is done by becoming the embodiment or the "antidote" to a certain type of suffering, which arises as a result of the sufferer being locked into the mindset that physical reality is all there is. The Bodhisattva is well aware of and can work with non-local reality to hold the space for the suffering to move forward. The further along the Bodhisattva gets in grounding their energies into the physical, the more people they can assist to heal. Opening to the experience of Bodhisattva is a very personal and powerful one on the path to healing, empowerment and enlightenment. You may think it is just for some. But let me assure you that this archetype is dead center on the path to freedom. So I'd like to show some practical ways to encourage and activate the energies of the Bodhisattva into your life. My healing modality utilizes the power of archetypal energies, Light, color and visualization. One exercise to bring in the power of the Bodhisattva and to further develop and integrate those characteristics into our life is balancing, integrating, and interweaving the energies located at the Sacral Chakra. The sacral chakra holds in it's structure the gateway for us to express our creativity, passion and sexuality by activating our life force in readiness for manifestation. This is more or less where the Kundalini energy coalesces before it takes physical form, as is outpictured by the womb of a woman being the container for the growing human embryo. There are two master archetypes that are working with us to teach us lessons and in layman's terms "running programs" within our psyche and energy body in the sacral chakra. They are the Martyr and the Emperor/Empress (or another name might be the Hedonist). These two powerful forces are neither good, nor bad in their own right. They just are. And yet, certainly one or the other can take dominance and help us spin our life out of control. The key lies in integrating these energies together. It might seem like an impossible task, considering how they seem to be polar opposites. It is important to understand that what will be created out of the merging of these energies within us, is yet a third thing: The Bodhisattva. Imagine a venn diagram and you can see how this occurs. (A venn diagram is two circles which are drawn partially overlapping that creates a vertical eye shape where the two circles overlap.) This is exactly how these energies work together. Where we want to stay is in the space of that eye, where the two meet. This is where the Bodhisattva energies become active in our life. Sometimes we are moving into that space without consciousness. The purpose of this teaching is to help you move and stay in that space more often, ultimately operating your entire life from that middle path with full consciousness, focus and will. The Bodhisattva has been there and done that....you can't play a player. It is very difficult to pull the wool over the eyes of someone who has admitted to the worst in their own self and has faced and continues to face their own fears and darkness. The Bodhisattva holds a great deal of light for this very reason; they are always shining the light of truth upon themselves. This release of their own suffering is what has made room in their aura and in their soul to hold these powerful energies. And it is in this way that they work with the archetype of martyr or the wounded healer. Yet, the wounded healer can be very dysfunctional all on their own. The wounded healer can help a great many people heal, but it is often at a great price and that is that this occurs sometimes through coyote medicine and they themselves are keeping their own woundedness in the dark by covering it with helping others. The opposing force to the martyr is the emperor/empress or hedonist. The hedonist loves life, enjoys pleasure and makes sure that they are well taken care of, especially on the physical level. As you can imagine, the hedonist is a prime candidate for acting out addictions and aggression, while the martyr is the one who represses and "acts in", meaning most of their transgressions are committed against themselves. Hopefully you can see how these two archetype could benefit by joining forces. The bottom line is that the martyr, who is willing to die for their cause needs to be balanced by the hedonist, who is willing to live for their cause. It is difficult to give what you do not have or know that you have. Therefore it is imperative in the development of the Bodhisattva that they begin to receive in order to share. This is where the power of the hedonist, put in check by the martyr can allow this new creature to emerge within: The Bodhisattva. This is the middle way, the middle path and is a vital component to becoming a healthy altruist. These archetypes are very, very powerful. Working with an archetype is like downloading a program that bypasses sensory input. This is working energetically and on a soul level. Even if you don't understand, your soul or your psyche will. A powerful method to integrate these energies is to do chakra balancing and healing work, concentrating especially at the sacral, root and solar plexis. Envision the color red at your feet up to your groin, now see the color yellow at your navel, allow these two color to merge at the womb area (below the navel) and see the color orange emerge. On your left side envision the martyr - even call to mind someone in real life or from history that you associate with this, and on your right side envision an emperor or empress. See each character in all their regalia. Allow these energies to permeate your mind. Now see them coming together in your womb area, and inside that color orange see them coming together and becoming one being. This is your Bodhisattva. Take this being and allow it to become as large as your physical body. See yourself heart to heart, face to face. Step into this being and allow yourself to feel the immense, wisdom, devotion, compassion and divine love as you mingle your energies. 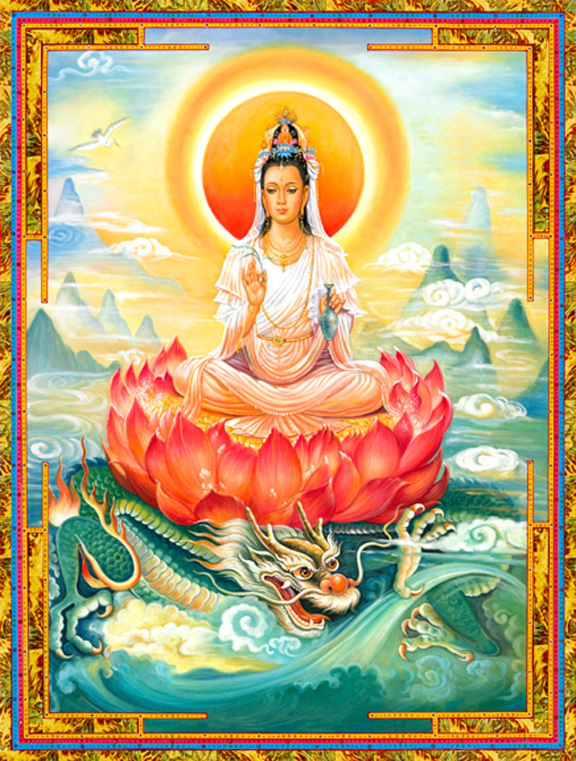 You have now drawn the divine matrix for the Bodhisattva to emerge in your life. This will open the gates of glory in your life. The irony is that the word glory will take on a whole new meaning. The glory will be for the great work. The glory will be that you understand that you belong to the world and the world belongs to you. There is no separation and so there is no sacrifice. The giving and the receiving are inextricably combined. Abundance will flow and you will create or become a part of a powerful legacy. When the Bodhisattva, this royalty shows up in your life, you will be at a place where your loss of innocence, all you have been through will be coming full circle and your life force will be activated in a way that you can't possibly now imagine. The beauty of it all will be revealed and you will see the undeviating justice at work in the world as you fully claim your personal power for the highest good of us all. May you walk in beauty. May you walk in peace. May you be overflowing with love and compassion as you create, integrate and embody your art, your work, your masterpiece in this world. They key is to feel like an empress and think like a martyr and you will be guided onto the middle path every time. This is the becoming of the Bodhisattva. I allow myself to feel without self-judgment or condemnation. My life gives me experiences that guide both my inner and outer choices. As I accept more freedom of choice, I accept responsibility for those choices. I trust in my owndivinity. I trust in the divinity of this creation. I allow higher powers into my life by calling to them. As I pray and meditate every day, I connect with my Higher Self. I reflect and contemplate the reality of my Higher Self. As I connect with my Higher Self, I notice miracles occurring around me. I say the Ho'Oponopono prayer to help and heal the world. I love you. I'm sorry, Please forgive me. Thank you. The suffering of one, is the suffering of all. I release the need for suffering in my life. I understand the undeviating justice in my life. Even as I allow my life to flow, I am guided to take right action. I am proactive because I am intuitive and empathic. I take my sensitivity seriously and safeguard myself. I see how I already have what I need, and need only open my eyes to it. I see doors and windows where there had only been walls. I protect my peace by being prepared. I am open to the unexpected and able to gracefully flow around any obstacles. I allow others to support and assist me. I ask for help when I need it, and I need it more than I think I do. I see my life as a collaborative creation. I am enough and what I do is enough. I trust that my gifts, no matter how grand or small help and heal the world. My love is a gift to the world. I love myself and do my best to relieve my own suffering. I speak kindly to myself no matter what. I am compassionate with myself and others. I am free of suffering.